If you own a home in the Minneapolis area, a fully functional gutter system is a vital component of a sturdy roofing system. Gutters are essential for reducing water and moisture damage to homes that encounter heavy rains. New gutters can go a long way to improve the value and integrity of your home. Gutters collect rainwater that lands on our roofs and direct it away from the house to the ground. Poor gutter systems can lead to water sitting too close to the structure of the house and can cause major damage. At Krech Exteriors, we install dependable gutter systems onto local homes in order to help their roofing systems last for years to come. If your home is equipped with an older model of gutters, it can leave you with a lot of maintenance during the wetter climates. Constant clogging of gutters with leaves and other debris can negatively affect your gutters from working properly. Krech Exteriors is the roofing contractor Minneapolis turns to for their top-notch gutter installation. Heavy rains can and do make an appearance often enough around our area that we at Krech Exteriors have learned to be prepared. Our factory-trained crews understands the ins and outs of a well functioning gutter system, having installed thousands onto local homes. The bottom line is if you can see a leak, the damage is done. When you hire our expert installation team, you are protected from these dangers by sturdy gutter systems. So if you start to see stains on your interior walls, don’t wait another second. 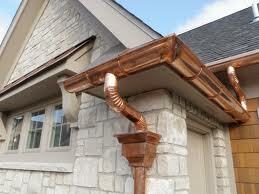 Call Krech Exteriors and set up a FREE in-home consultation on the installation of new, high quality gutters. It could mean the difference between simple repairs and a full roof replacement.